When the kids had chicken pox I was searching desperately for things to keep them busy, and came up with a play dough recipe that has every ingredient that I could think of that was recommended for use with chicken pox. This is the ultimate in soothing hand play dough, it's also great for kids with sensitive skin, allergies, gluten intolerance and eczema. This is a play dough that you'll need to make on the stove, which is not my favourite way of making play dough as the kids can't really help in the making process, but it is so fantastic that it's worth making it yourself so that they can play later! I started by mixing the water with a bit of food colouring and the coconut oil, then I added that to the baking soda and corn flour in a pot on the stove over medium heat. Then I just had to stir and stir and wait for the magic to happen! It goes from a thin liquid and suddenly starts to thicken up and turn into a dough before your eyes, then you just remove it from the heat and stir it a bit more. I then scooped it out and put it onto some greaseproof paper on a tray to cool down a bit (it will be very hot) and then put the oats and a few drops of lavender oil on top, folding the oats into mix them through. Then I rolled our dough into a couple of balls and put them on trays for the children to play with. 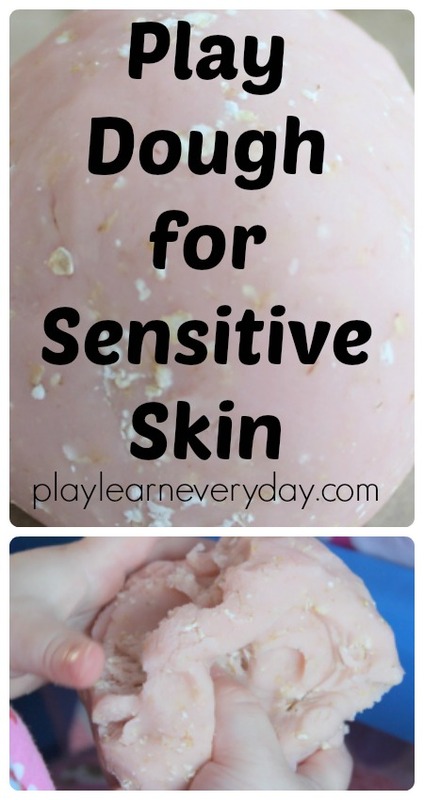 I didn't give them a lot of tools as my main goal was to have them handling the dough as much as possible to benefit from all of the ingredients that would help soothe their itchy skin. I gave Ivy the parts from a Mr Potato Head set to make his own play dough face and I gave Ethan a selection of buttons to make a face. They had lots of fun rolling and squishing and placing the different items into their play dough to create their chicken pox faces, and found it hilarious to be putting the spots all over the faces. The dough was super soft to play with and smelled fantastic. When they were finished playing I put it into an airtight container so that they could play with it again over the coming days, it was so easy to make and great to enjoy playing with and keeping them distracted from their itchy skin! Actually, random thought - the recipe reads like the resulting playdough would smell rather nicer than the stuff you buy in the shops? Youngest loves playing with dough but I can't abide the smell of it! Well I wouldn't wish it on you any time soon, but this really is a nice way to keep those itchy little hands busy! I never knew you could make your own, that sounds weird, but so true!